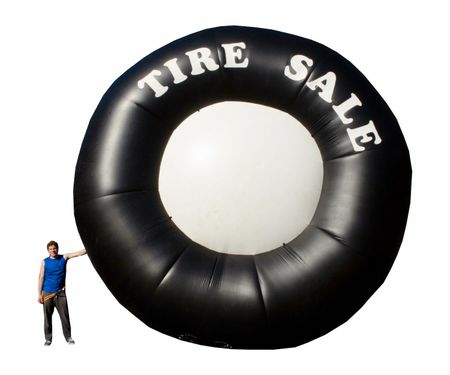 Drive business to your store by drawing maximum attention to drive by traffic with this giant inflatable tire. Made of high quality 7.5 oz. coated nylon. The entire inflatable is completely double stitched with extra heavy 207 thread for long life. Four anchor points on the front and four on the back with anchor points on his feet for easy installation. We made this inflatable here in the U.S.A. and are proud of it.